So…you think you are something pretty special, eh? Guru, expert or….(seriously?) a “Thought Leader.” Tell me, Svengali, what Jedi mind tricks are you able to pull off, here? If you sincerely want to be an expert, leader or luminary in your field, you’ll have to let other people do the talking for you unless you are Donald Trump…egomaniac Billionaires are untrainable. Heck, even in his case, the population is talking about him 100,000x more than even HE is talking about himself! it is only given to those who earn it. When you create value…tangible, useful value that people can actually identify, measure and monetize, you’ve got something. While intangible, ‘feel good’ content can often be worthy, it is worthless without a clear cut path to actualize it. Feeling inspired? Great…go save the whales. Do you have a mindset issue? (we all do). Great…change that, then ACT upon it. I cherish the times in my life where I dove deep into a good book or couldn’t stop talking about a motivational speaker. I’ve had the pleasure of reading all of Bob Proctor’s books and seeing him speak live. But, had I not used those moments to rewire my personality, attitude and actions, the years I invested would have been wasted. Inspiration is important. I’m not saying it isn’t. However, inspiration without action is worthless. The old adage, “To know and not to do is not to know” is true. Don’t let any dead philosopher tell you otherwise. To simply regurgitate “Think and Grow Rich” and not apply the wisdom in the book means you don’t actually understand or believe it. Information is not the same thing as wisdom. 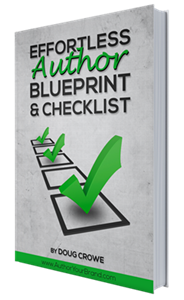 “Effortless Author Checklist” Get This for FREE! Doug was not born in a slum, nor was he homeless or raised by wolves. While that may make for a more inspirational story, it simply isn’t true. He did, however, win the Dale Carnegie Highest Achievement award as a high school student and was one of the youngest trainers for that organization. He graduated from Northwestern University with a B.S. in speech and a concentration in TV and film. Doug is an accomplished writer having contributed to the Chicago Tribune, Daily Herald, MSN Money, Yahoo Finance, the Seattle Times and has authored several books.